i was really excited to hear that Fergie was releasing another scent! 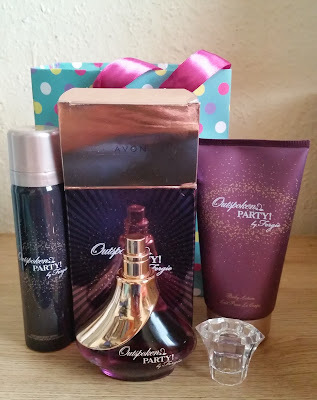 Exclusively through Avon, i waited with anticipation to get my hands on Outspoken Party. I bought this as a gift for my mums birthday but wanted to review it as it smelt so good! It contains accords of raspberry, peony, sandalwood and creme brulee. body lotion 150ml and the body spray 75ml. Sweet. Woody. Fruity. Milky. Floral. The bottle is the same design shape as other Fergie fragrances but i really like Outspoken as it commands your attention. The bottle possessing a half gold cover and the other side showing the purple fragrance inside. These two colours work so well together it gives that wow factor to the bottle! Outspoken opens up with a huge burst of sweet fruits, those raspberry and red fruits make there entrance. The sweetness coming from the creme brulee that smells of caramel and vanilla. This is a safe sweetness, not in your face, but working well together with those fruits. Then Outspoken gets interesting, the flowers come in gently that soften that sweetness just a little and those fruits get gently softened, all working together in harmony. your left smelling your wrist in awe! Thanks to the peony, a fresh floral with added musk. Projection is really outstanding and longevity is really great, lasting all day. Outspoken is Fergie's best scent to date, taking you on a divine smelling journey you will want to experience again and again. Suitability is very freeing as this can be worn for daytime, night time, it really will suit any occasion but if you wear this to a party then you really will be, the talk of the party.